Carpenter ants are common sights in the Americas, Europe and other parts of the world. Because carpenter ants cause damage to wooden areas where they nest, their presence can be mistaken for a termite infestation. 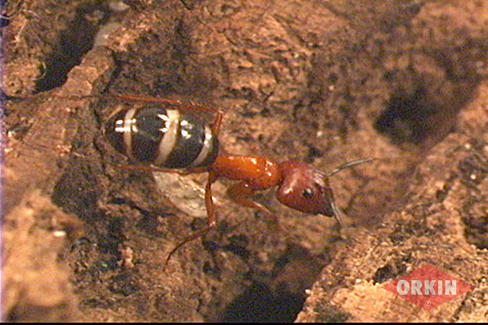 However, while termites eat wood, carpenter ants merely make galleries in wooden areas for shelter. There are 24 pest species of carpenter ants in the United States alone. For this reason, carpenter ant identification can be difficult. Size and color of carpenter ants can vary among species and even among individuals within one colony. Carpenter ants measure from 3.4 to 13 mm in length and can feature black, red, brown, yellow, orange, or red and black coloration. Although carpenter ants are among the largest ant species worldwide, size is not a reliable factor in carpenter ant identification because workers within a species vary in size. Carpenter ants are often mistaken for termite swarmers, particularly during swarms when winged male and female ants fly out of their colony to mate. The most important characteristics to look for when identifying any winged ant are elbowed antennae, a pinched or constricted waist and a front pair of wings that is longer than the back pair. Termite swarmers will have straight antennae, a broad waist and both pair of wings similar in length. Locating carpenter ant nests can be accomplished by following the trails of the worker ants themselves. Search for a clean and smooth cavity in the infested area, as well as slit-like windows in the surface of the damaged wood. Small piles of wood shavings can often be found below the openings. After identifying a colony, it is advisable to contact a pest control professional, as several satellite colonies may exist elsewhere within or around the home or building.